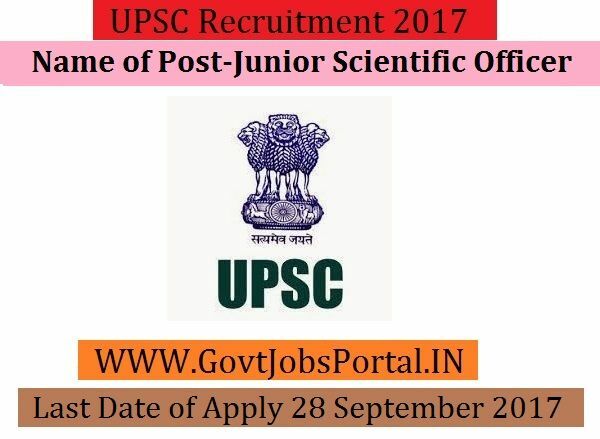 Union Public Service Commission is going to recruit fresher candidates in India for Junior Scientific Officer Posts. So, those candidates who are willing to work with this organization they May apply for this post. Last Date of Apply 28-September-2017. Total numbers of vacancies are 07 Posts. Only those candidates are eligible who have passed M.Sc. in Microbiology from a recognized university or institute; Or M.Sc. in Botany with specialization in Plant Pathology or Microbiology or Mycology from a recognized university or institute; Or M.Sc. in Agriculture with specialization in Soil Science or Agricultural Chemistry or Agronomy or Microbiology or Plant Pathology or Horticulture or Agricultural Extension from a recognized university or institute or Master’s Degree in Physics/Biophysics/Forensic Science with Physics as one of the subjects at Bachelor of Science level from a recognized University or equivalent. Indian citizen having age in between 21 to 40 years can apply for this Union Public Service Commission Recruitment 2017. Educational Criteria: Only those candidates are eligible who have passed M.Sc. in Microbiology from a recognized university or institute; Or M.Sc. in Botany with specialization in Plant Pathology or Microbiology or Mycology from a recognized university or institute; Or M.Sc. in Agriculture with specialization in Soil Science or Agricultural Chemistry or Agronomy or Microbiology or Plant Pathology or Horticulture or Agricultural Extension from a recognized university or institute or Master’s Degree in Physics/Biophysics/Forensic Science with Physics as one of the subjects at Bachelor of Science level from a recognized University or equivalent.